Giving Works enables eBay buyers and sellers to donate a portion of their transactions to a nonprofit of their choice. eBay’s devotion to CSR (Corporate Social Responsibility) really shines in the program’s details. Sellers receive a credit for fees attributable to the amount donated, so they don’t pay a commission on that portion of the sales price. (eBay buyers don’t pay transaction fees.) The PayPal Giving Fund, which collects and dispenses the donations, does not charge a processing fee, ensuring that 100 percent of each donation reaches the designated nonprofit. I learned more about Giving Works and eBay’s strategy for powering charitable giving through a Cause Marketing Forum webinar in July. The event featured Sean Milliken, eBay’s Head of Nonprofit Strategy. I also had an opportunity to interview Milliken in August. 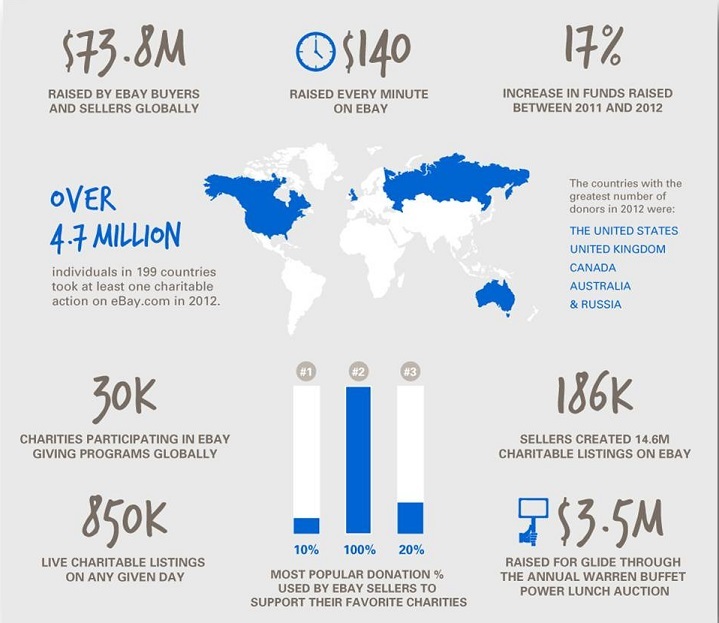 Powering charitable giving, Milliken explained in the webinar, revolves around using eBay’s unique assets to create the world’s largest platform for chartable giving. It is one of three priorities at the heart of eBay’s CSR strategy; the others are creating economic opportunity and enabling greener commerce. The impact of eBay’s powering giving initiative goes beyond the millions of dollars raised for charity. eBay’s customers, retail partners, and the company itself also benefit. How? According to eBay’s research, as a result of making donations to accredited charities, sellers typically receive a higher price for their products. In addition, among customers who participate in the Giving Works program, eBay’s churn rate (the percentage of accounts that become inactive) is significantly lower, and its net promoter score (the difference between the percentage of customers that recommend eBay to others versus the percentage that do not) is significantly higher. Integrate your business goals and CSR efforts. CSR activities are not delegitimized when they benefit the company as well as society. Without economic vitality, a company cannot undertake CSR efforts. eBay’s adherence to this principle is evident in the way the company approaches CSR and develops its CSR strategy. As Milliken told me, Our philosophy is to embed social innovation into the core of the business; the programs that create impact for business and society really need to emanate from the business [units] themselves. eBay’s CSR strategy is the product of discussions among the social innovation team (Milliken’s department) and leaders of the company’s business units, (e.g., eBay, PayPal, StubHub!, etc.). The result is a coordinated CSR strategy that all operating units are committed to executing. Be authentic. The authors of the outstanding CSR guide, Good Works! advise companies to choose causes that have synergy with their mission, values, products, and services. Consumers are less likely to be suspicious [w]hen corporations contribute to causes that make sense? eBay’s powering giving efforts are entirely consistent with the company’s business activities, and draw heavily on its services, technology, and other strengths, which help explain why customers are so responsive. Think big. 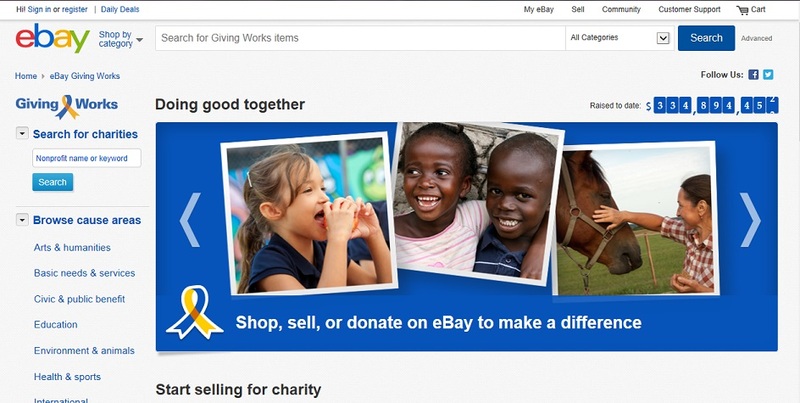 eBay is not content to raise millions of dollars for worthy charities. The mission of its powering giving initiative is to become the world’s largest platform for charitable giving. Can’t get much bigger than that. Be SMART. In PR, we preach the importance of setting SMART (Specific, Measurable, Agreed upon, Realistic, Timed) objectives, but do we practice what we preach? eBay certainly does. eBay’s broad goal, Milliken explained, is to increase the pie of resources available for organizations that are doing great things. From there, eBay’s social innovation team and business units established three time-specific, measurable, mutually agreed upon objectives: doubling the number of customer donors, funds donated, and participating charities by 2015. Test and learn. Measuring outcomes is an essential function of every business department, including PR and CSR. Not only has eBay’s social innovation team embraced this principle (see statistics below) , but it has taken it one step further by using experiments, metrics, and other research to determine which tactics produce the best results for sellers, retail partners, and nonprofits. For example, through analysis of giving patterns, eBay found that when customers can choose the specific charity to which they donate, the amount they give is 20 times higher. Engage your customers. Selecting causes or issues that resonate with customers increases the impact of CSR initiatives, as eBay discovered through the research described above (see number 5). Generating and leveraging customer engagement are critical components of eBay’s growth strategy for its powering giving initiative. According to Milliken, The way to increase the charitable pie is to engage more of our users and turn them into actual donors. Rather than going the traditional route and choosing our favorite organization and asking others to join us in supporting them, our approach is to connect people with the causes they care about by offering easy ways to give to those organizations. These six practices largely explain why eBay’s “powering giving” CSR initiative has been so effective. The beauty is that most companies have the capacity to tailor these practices to their business goals, corporate structure, product offerings, and customer expectations, and by doing so, they will experience similar success. 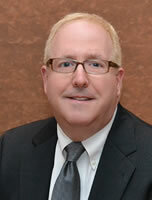 Bill Madway is a PR consultant, marketing educator, and member of the Empowerment Enterprises executive team. His biweekly column appears on EmpowermentPR’s website. Have a question, comment, or suggestion for Bill? Send them to wmmadway@empowermentpr.com. Follow Bill on Twitter @thtleader. Images are used with permission from eBay.